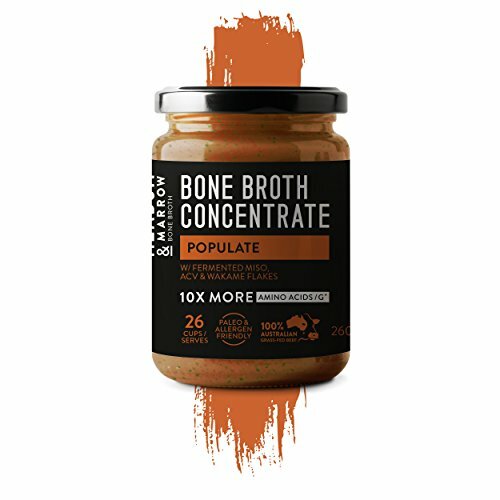 Populate - Performance Bone Broth Concentrate Range- 9.17oz Improves Digestion, Balance Gut Flora, Anti-Ageing. Traditional Miso with Apple cider vinegar & Wakame flakes. POPULATE BONE BROTH: The ultimate happy gut tonic! Traditional organic fermented Miso is rich in beneficial bacteria, digestive enzymes, antioxidants and is widely theorised as the reason the Japanese enjoy the longest life span on the planet. When combined with Organic Apple Cider Vinegar, Wakame Flakes and of course the World's most nutrient dense Bone Broth - the only thing happier than your gut will be your taste buds. IMPROVE DIGESTION: HELP BALANCE GUT FLORA: ANTI-AGEING. REVERSE BONE, LIGAMENT, MUSCLE AND JOINT PAIN: Helps maintain & repair nutrient deficiencies whilst reducing inflammation for stronger bones and less painful joints. IMPROVES AGING INCLUDING HAIR,SKIN AND NAILS: The high collagen content is renowned as a true anti-aging asset that improves skin elasticity and firmness, diminishes wrinkles and supports nail and hair quality. REDUCE MOOD DISORDERS LIKE ANXIETY FATIGUE AND DEPRESSION: Many mood disorders have now been linked to poor gut health. If you have any questions about this product by Meadow & Marrow Bone Broth, contact us by completing and submitting the form below. If you are looking for a specif part number, please include it with your message.